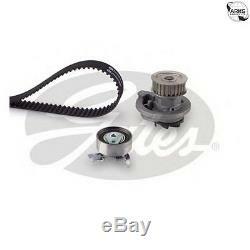 Water Pump & Timing Belt Kit - Gates KP15367XS. Supplementary Article/Supplementary Info: with water pump. Replaces following reference(s): HELLA: 8MP376807891 RUVILLE: 55315701 BOSCH: 1987948744 DAYCO: KTBWP2540 SKF: VKMC05402 QUINTON HAZELL: QBPK3391 BEHR HELLA SERVICE: 8MP376807891 TRISCAN: 8647240011 GK: K980732A HUTCHINSON: KH98WP21 FLENNOR: FP04256V FAI AutoParts: DTTWDFAI. Brand: Gates Part Number: KP15367XS. (We can mark the item as a'gift' if requested to, but we will not declare any different amount). Our vision is to not only provide the best online shopping experience for our customers, but also to provide the best experience for companies new to the e-commerce world looking to sell their products globally. We have a large selection of items available for sale in our stores, however if you cant find what youre looking for, please feel free to get in touch. This is our preferred method of contact. The item "Gates Powergrip Wpk KP15367XS" is in sale since Thursday, August 18, 2016. This item is in the category "Vehicle Parts & Accessories\Car Parts\Engines & Engine Parts\Belts". The seller is "sellyservice" and is located in Sheffield. This item can be shipped worldwide.